A delicious kale salad with quinoa, dried cranberries, smoked feta, and sunflower seeds. Hearty and filling, this kale salad is a real crowd pleaser. When we first moved overseas, nearly four years ago now, every time we flew back to Stockholm from Vancouver I would pack an extra suitcase, filled to the brim with foodstuffs. I’d cram exotic flours, nutritional yeast, hemp seeds, frozen tempeh, maple syrup, and basically anything I could buy at Whole Foods into an often already overweight bag. And Ziploc bags. Always Ziploc bags. Over the years I found a few specialty stores around Stockholm where I could hunt down some of my must-haves, and on weekends you could find me traipsing across town to procure cocoa nibs, chia seeds, or coconut oil. In the last year, though, some of those things started turning up in my neighbourhood supermarkets. Chia seeds? No problem. Non dairy milk? My store now has oat, soy, almond, hazelnut, rice, and coconut milk. Alternative flours? You name it, they’ve got it. Kale has always been, in my opinion, ridiculously hard to get in Stockholm. It’s funny that a cold weather crop was so evasive in a cold country, but it was previously a specialty item found only at the farmer’s market (which runs-mid August to mid-October) or at Christmas time. But suddenly, kale is everywhere. Now I actually can’t remember the last time there wasn’t kale, both curly AND Tuscan, at every store in my ‘hood. The food situation has improved so drastically in the last year, that when I made this kale salad to take to an early-season barbecue last weekend, my biggest problem wasn’t finding the ingredients, but choosing them. You see, when I read the original recipe and saw that it called for ricotta salata I figured I’d have to make a substitution. But no, I found myself standing in the cheese section with ricotta salata in one hand and smoked feta in the other. After a couple of minutes of crippling indecision I ended up going for the smoked feta, because, I mean, smoked feta, and it is definitely a decision I did not regret. This kale salad calls for Tuscan kale, also known as Lacinato kale, dinosaur kale, or black kale (svartkål in Swedish), which has a slightly mellower flavour than it’s curly cousin. It’s sliced into whisper-thin ribbons, and after a good toss with a zippy honey Dijon vinaigrette, the kale loses a good amount of it’s bite. Cooked quinoa, crunchy sunflower seeds, dried cranberries, and that salty, smoky feta add some meat to the bones of this salad, as it were. As leafy greens go, I think that kale is uniquely qualified in the plan ahead / make ahead department. Because the dressed leaves only get more palatable with (a reasonable amount of) time, this kale salad makes great packed lunches or make ahead dinners; you can be sure that the kale salad you put together on the weekend will still be perfectly good for your lunch on Wednesday. I can vouch for that. I probably don’t need to tell you that kale is good for you, but I at least want to share some new to me information. My friend Kellie is a cancer-related health educator and nutrition advisor and if you’re not already familiar with her blog I suggest you check it out. She recently wrote about kale and cruciferous vegetables (and a tasty smoothie recipe to boot! ), and I learned from her that cabbages (including kale) are now seen as more effective than tomatoes at preventing most forms of prostate cancer. Kale is a nutritional powerhouse! It is extraordinarily rich in micronutrients, dietary fiber, anti-oxidant and anti-inflammatory nutrients, and cancer fighting glucosinolates. Kale is a good source of vitamin C, beta-carotene, manganese, and contains nearly twice the vitamin K (essential for blood clotting and also an important anti-inflammatory agent) than any other cruciferous vegetable (broccoli, cabbage, etc). Iron, magnesium, vitamin E, folate, and phosphorous are among the complement of vital minerals found in kale. The dietary fiber in kale is known to reduce blood cholesterol levels. Quinoa not only has a very high protein content (about 18%), but this super seed also contains a complete set of essential amino acids, making it a complete protein. It’s a great source of dietary fiber, phosphorous, and is high in magnesium and iron. Start with cooking the quinoa. Rinse the uncooked quinoa, then place in a small pot with 1.5 cups of water (I like my quinoa a bit on the drier side, especially if it will be tossed with a dressing later). Bring the quinoa to a boil over high heat, then cover, reduce heat to low, and simmer for about 15 minutes until the liquid has been absorbed. Set aside to cool, or if you want it to cool quickly, you can spread the quinoa out on a baking sheet. While the quinoa is cooking, get the kale ready. Give it a good rinse, then pat dry and de-stem the leaves. You can cut the thick stems out with a sharp knife, or hold the base of the stem in one hand and pull the leaf from it with the other. Stack the de-stemmed leaves on top of one another, and using a very sharp knife, slice them into very thin ribbons. 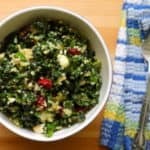 Place the kale ribbons in a large bowl with the cooled quinoa, sunflower seeds, cranberries, smoked feta, dill, and green onions. In a small bowl whisk together the remaining ingredients for the dressing. Pour the dressing over the salad, and give everything a good toss. Let the salad stand for about 10 minutes before serving - a longer stint in the fridge is perfectly fine. Of late, your emails are coming in very strangely. Has anyone else commented on this? This is the first I’ve heard of it. Strange in what way? Thanks Deena. The smoked feta really is incredible. I hope you can get your hands on some! It’s the first time I’ve used it, but I’ve found it in a few shops around the city, so it can’t be all that rare. It’s totally my new favourite thing! This salad sound delicious especially now that I am a kale salad convert! I am definitely going to see if I can find some smoked feta at the store. Very interesting!!! I hope you can find some! I still think of your kale salad with pickled pumpkin! Smoked feta is a real game changer, but I have a thing for any smoked cheese so I’m biased in that direction. It is very healthy, but also very delicious!